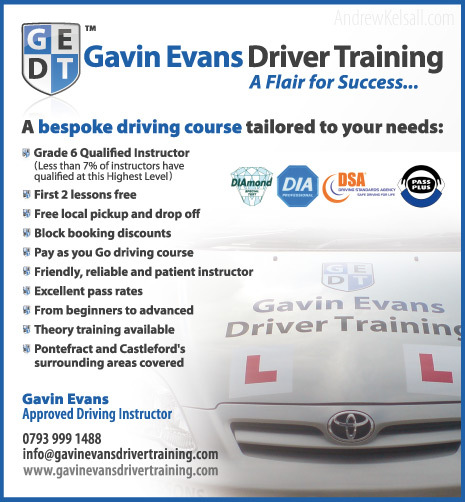 I was tasked by Gavin Evans, a driving instructor based in Hemsworth and Elmsall, West Yorkshire (UK) to design a logo and marketing designs for his Instructor Training Business named Gavin Evans Driver Training (or G.E.D.T). 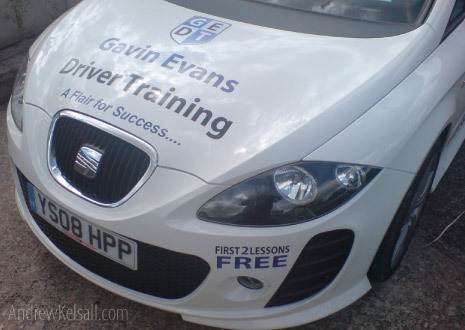 Basically, Gavin takes pupils and teachers them to drive and even does advanced motorway training courses. After discussing his requirements, we settled on a logo design based upon a shield motif with the initials G.E.D.T incorporated into it. The image above shows this design in its print-formation (I’ll get to that next). 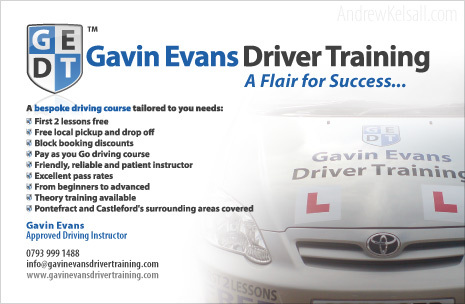 I initially suggested a shield-based design to Gavin, as shields represent strength, authority and stability — all positive aspects of what a Driving Instructor could possibly convey to any potential pupil. The great thing about this logo is the varied configurations that it can possess. The image above displays an alignment that is more fitting for limited horizontal space (such as when on the bonnet of the car). I used the logo design to create an advertisement (above) which featured in the Thompson Local (advertising directory) to both sustain and promote his growing business. As can be seen, the logo configuration I used here also coined the tag-line A Flair for Success. 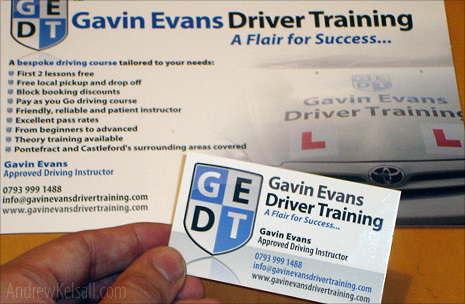 This tag-line was used on all marketing and promotional material for Gavin’s Driver Training Business. The car print displayed above shows some of the general layout and colour-scheme of one of the two cars he has used to instruct pupils in. The sides of the car display his web-site address and other information. The flyer design (postcard) shown above was printed onto 350gsm gloss-card and distributed throughout local areas around Hemsworth and Pontefract, West Yorkshire. I also designed some business cards for Gavin printed onto the same type of card. The photo above shows one of the glossy cards, with the flyer (pamphlet) design in the background. 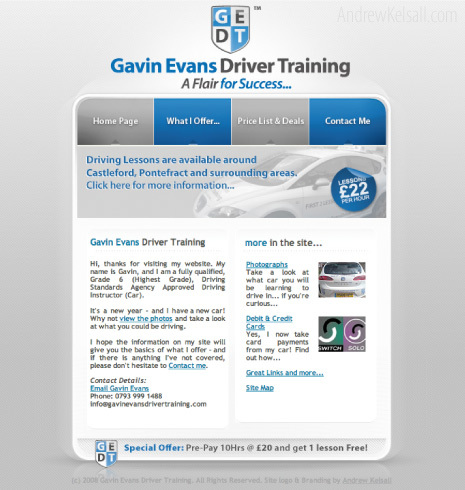 I also branded a web site design for Gavin, which is a place where potential pupils can contact him. The site displays his pricing structure as well as photos and other relevant information. Recently, Gavin asked me to design some marketing material for the franchise side of his business. I suggested to him that it would be a great idea to segregate the two sides of the business with a different colour-scheme, with orange/grey being the most attractive and meaningful. As orange is associated with optimism, it ended up being chosen simply because it worked well and looked great. Again, I designed a flyer for Gavin which is to be printed soon. This design is currently being used for various online publications on the internet. 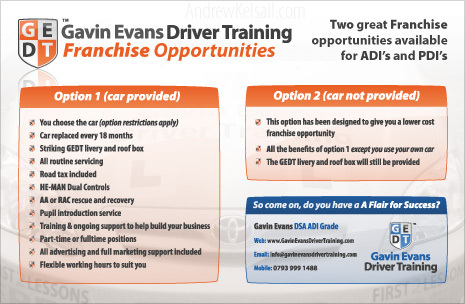 If you run a Driver Training Business and would like me to work with you on a logo design, marketing, promotion and car print (livery print design), please contact me for details. Nice, especially seen in its applications. Did you do the website too? I ‘branded’ the website, meaning I used a web template which Gavin Evans chose, and used the base code/css to create a web site for him. It wasn’t in Gavins budget for me to design a site from scratch. A nice site, especially considering the budget! Great job. It’s nice to see so many elements – business card, flyer, website, etc. – all with consistent branding and done very well. I like the fact that you’ve managed to keep the shiny feel and reflection of the shield on both print and web. Some people would have kept that for the web but gone for flat colours for the print. Well done for not doing that! What was the template you used for the website? The budget was quite good, but the original intention was for mostly print work, with the web design discussed well into the project, but the template worked really well. I chose to keep the very web-2.0-styled reflection in place because of the customer age range of mostly 17-21 year olds, so it was a viable solution to keep this consistent branding across print, media and livery. Hey y’all. Firstly can I just say that the tag line was my idea!! Right from the get go Andrew was very open to the suggestions that I put forward and very efficient in the work he has carried out for me. He started work with me early last year and since then my business has gone from strength to strength and Andrew has been there every step of the way developing and inventing new advertising and marketing ideas. This is quite a nice little project – i like the website too! ← How to get a Design Job using Tinned Meat!